Morning colors rise in the valley below Spruce Knob. The area has more than 60 miles of trails ranging from 0.6 to 13.1 miles. From the main parking area, it's a 0.2-mile walk to the summit. With so many options, the Spruce Knob-Seneca Rocks Recreation Area can be as challenging or easy as you want. The main parking area is just 0.2 miles from the summit. But, there are other trails that zigzag all through the valley and along the mountaintop, and they have various lengths and degrees of difficulty. The area is accessible year round, although it's best in the spring and fall when the weather is more likely to cooperate. The Spruce Knob-Seneca Rocks National Recreation Area is a hiker’s paradise, and has more than 60 miles of trails ranging from 0.6 miles to 13.1 miles long, with difficulty levels from easy to challenging. Because the area has so many trail options, it has something for just about everyone. There’s the short walk to the observation tower, but also options for day hikes and longer backpacking trips. One of the trails, the Spruce Knob/Seneca Creek Circuit, has even been categorized as one of the 5 “best backpacking routes in the mid-Atlantic.” Trailheads are scattered all along the forest roads that intersect the Spruce Knob and Seneca Rocks area making the area easily accessible. From the Spruce Knob summit, the vantage point gives a 360-degree view of the surrounding Allegheny Mountains and Monongahela National Forest. The trails that zigzag through the park below, some of which lead to this summit, venture through meadows, along mountainsides, into dense spruce forests, and along rocky ridges. Here, rhododendron and blueberry flourish, creating a colorful canvas through spring, and in the fall, the forest erupts in fiery hues in every direction. If you just want a short hike to the viewing tower, park in the main parking area and walk 0.2 miles to the top. From the Spruce Knob summit, you get an amazing 360-degree view of the surrounding Allegheny Mountains and Monongahela National Forest. The trails that zigzag through the park below, some of which lead to the summit, venture through meadows, along mountainsides, into dense spruce forests, and along rocky ridges. Here, rhododendron and blueberries flourish, creating a colorful canvas through spring, and in the fall, the forest erupts in fiery hues in every direction. 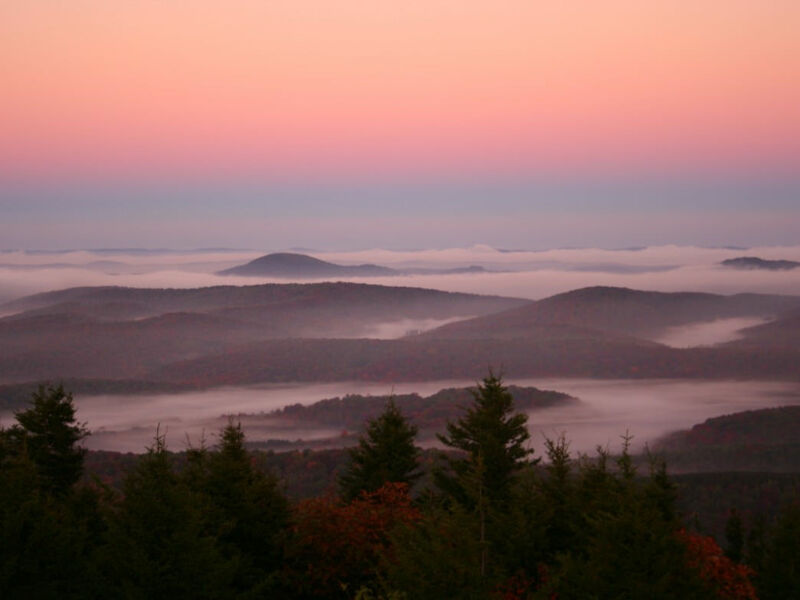 If you are looking for something a little longer, try the moderate 5.2-mile Huckleberry Trail that connects Seneca Creek— a mecca for trout fishing— to the Spruce Knob viewing area. Once you’ve climbed the 1,000 feet to the trail’s highest point, you’ll spend much of the hike trekking along the ridge, overlooking the Allegheny hills and national forest below. If you are interested in embarking on an overnight trip or backpacking excursion, the circuit Hiking Upward calls one of the best in the Mid-Atlantic is the Spruce Knob/Seneca Creek circuit. It’s a 16.5-mile trek that begins and ends at Spruce Knob’s summit (remember the summit is a quick .2-mile hike from the parking lot, so it’s easy to get to). The trail takes you along ridges above the rocky spruce valleys, along the blueberry bushes that line the rocky cliffs, and into the dense forests that the Monongahela is known for. You’ll probably spend 2-3 days to complete this circuit. The recreation area provides opportunities for both hikers and backpackers, as well as rock climbers with the ridges and rock walls. With an abundance of trail distances, folks can enjoy a leisurely walk through the woods, or a hearty climb to an overlook that’ll reward them with views from the greatest summit in the state. Conditions at the top of Spruce Knob can be windy, and are many say it has an alpine look because of its wind-shaped mountaintop spruce. Spruce Knob has plenty of outdoor opportunities for hikers, backpackers, and rock climbers— there are several ridges and rock walls in the area. With an abundance of trail distances, you can enjoy a leisurely walk through the woods, or get your blood pumping with a hearty climb to a summit overlook. Conditions at the top of Spruce Knob can be windy, and it has an alpine look because of its windblown, mountain-top spruce. To get to the Spruce Knob overlook: Take U.S. Route 33 toward Judy Gap. There is a sign for Spruce Knob at the junction of U.S. 33 and County Road 3314. Turn onto County Road 3314, and follow it for 2.4 miles to a “Y” intersection, where the main road becomes Public Road 112. Stay to the left at the “Y” to follow Public Road 112. Stay on 112 for 7.2 miles, and then turn right onto Public Road 104. 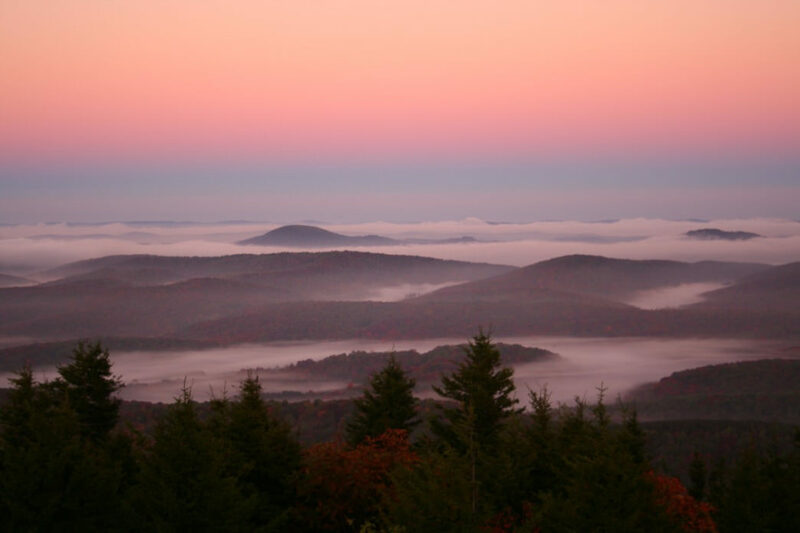 The parking lot for the Spruce Knob overlook is less than 2 miles away on Public Road 104. The walk up to the tower is just 0.2 miles from the parking area. You can also begin the Spruce Knob/Seneca Creek circuit hike (16.5 miles) here. The other trailheads are all along the surrounding forest roads. If you do an overnight hiking trip, practice “Leave No Trace” ethics and make sure your campsite is at least 200 feet from trails and streams.